Tim Manus sits at a table at the Voices of Homelessness event. Photographs taken by some of the artists hang on a wall at Pete's Diner. People gather for the Voices of Homelessness event. A photograph hangs on a wall at Pete's Diner in downtown Lafayette. People gather at Pete's Diner for LTHC's Voices of Homelessness event. 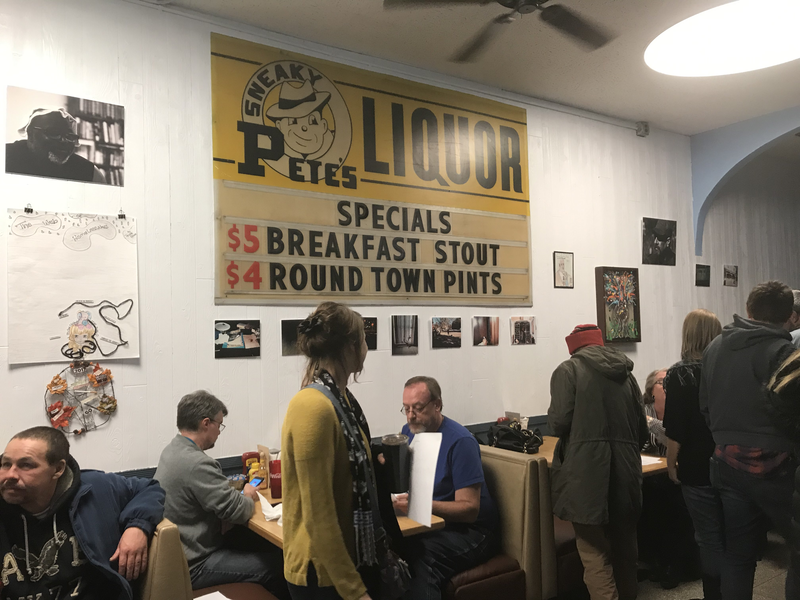 Above the slick vinyl booths and vintage arcade games at Pete’s Diner now hang works of art by many lesser-known artists of the area—current and former homeless men and women of Greater Lafayette. This past year, individuals familiar with homelessness documented their daily lives by snapping pictures with disposable cameras that were provided to them by a Purdue multimedia writing class. Students wrote a variety of prompts to generate inspiration and met with the artists regularly to discuss the stories behind the photos. Purdue undergrad Adam Shay says the exhibit’s grand opening, held just before Thanksgiving, wasn’t originally planned. “We realized we had all of these beautiful photos and narratives we were creating, and we weren’t able to share them, so we wanted to create this event where we could bring it all together, and show the community what these people also experience, and share their stories,” Shay says. Lafayette Transitional Housing Services, or LTHC, also encouraged people to submit poems for the gallery event, as well as other works of art. At the unveiling, Tim Manus sits quietly, alone, at a table; numerous poems scattered in front of him. He’s been a Lafayette resident his entire life, but he’s been sleeping in a tent along the Wabash River for the past three months. Even in his current situation, Manus still clings to a positive outlook. “No matter what position you’re in, you’ve always got the Lord there,” Manus says. He began writing five years ago, but says he never considered any of his work to be good. He had seen LTHC’s flyer on the door of Pete’s Diner requesting art submissions, so Manus decided he would enter a piece. His poem, titled “Voices of Homelessness” inspired the name of the gallery event. LTHC Development Director Jennifer Shook says she hopes to make the gallery event an annual affair. “So to see the students really shift their idea of what homelessness is and who are the people experiencing homelessness—and they’re not bad, and they’re not scary, and they’re not at all who I thought they were—has been really a rewarding experience,” Shook says. The poems and works of art will be on view at Pete’s Diner, on Main Street in Lafayette, for about a month.